Large 2 bedroom 2 bathroom apartment sleeping 4/6 comprising the whole of the first floor of a 19th century converted farmhouse (159sq m - 1679sq ft). Large open plan living,dining/kitchen area with large island unit/breakfast bar with extensive fully-fitted kitchen. 2 large air-conditioned bedrooms both en suite, the master en suite having a corner bath, large separate shower, twin wash basins and bidet. Large outside terrace(24 sq m). The apartment conversion was only finished in December 2012 to a high standard. The air-conditioning is efficient and very quiet and is generally required in July and August. Many original features have been retained including the former hayloft roof open to the rafters (now the living/dining/kitchen area) and exposed brick vaulted ceilings in the bedrooms and corridors. If sleeping 5 or 6, this will be on high quality convertible beds suitable for children or young teenagers (extra charge of 100 Euros per bed). 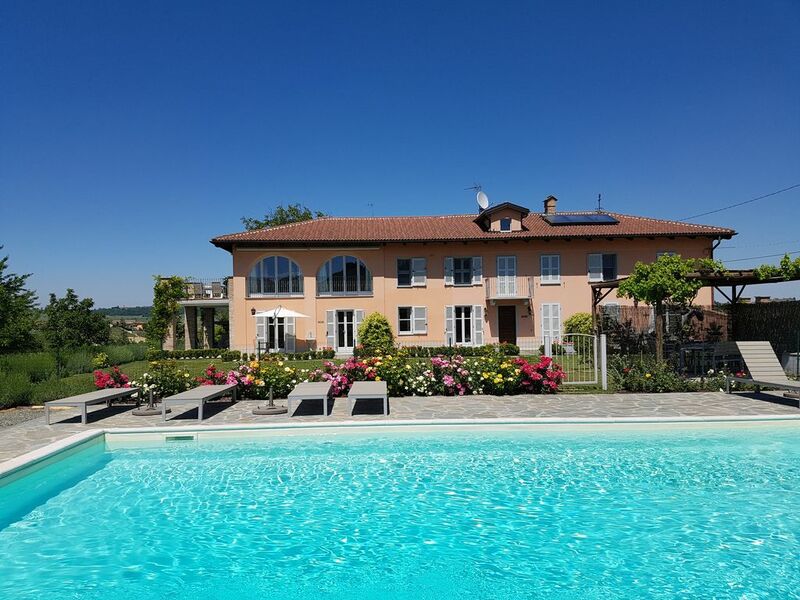 Cascina del Noce (pronounced kasheena-del-notchay) is a beautifully restored and fully modernised Piemontese 19th Century farmhouse which has been converted into 3 apartments, Alba, Asti and Canelli. The works were only completed at the end of 2012 and there is a high standard of finish throughout with many of the original features being retained. All the bedrooms are air-conditioned with new, efficient and extremely quiet units. Outside there is a large unheated fenced swimming pool (12m x 6m) with ample space for sunbeds. The pool is shared between the 3 apartments with a maximum combined occupancy of 14. The pool is south facing and is sunny from dawn till dusk and has views of the surrounding countryside. There are 10 sunbeds and mattresses around the pool with 5 umbrellas and tables. Cascina del Noce is situated in the hamlet of Balbi near the village of Castiglione Tinella. It is just in the province of Cuneo on the edge of the Langhe hills and is on the top of a ridge surrounded by vineyards growing the moscato grape. There are views on 3 sides and it is in the heart of an area that is a candidate for UNESCO world heritage status, largely because of the shaping of the landscape by 2,000 years of viniculture. A car is essential, both to transfer to the apartments and for shopping and other activities. There are a few local shops for essentials but there are several supermarkets, including a large hypermarket, within 15 minutes' drive. There are also local markets selling fresh produce in all the local towns and villages. Alba occupies the whole of the first floor with 2 bedrooms and 2 en suite bathrooms with a large outside balcony/terrace and sleeps 4/6. Asti and Canelli comprise the ground floor. Asti has 2 bedrooms and 2 bathrooms with 2 large private outdoor areas and sleeps 4/5. Canelli has 1 bedroom and a large private patio area and sleeps 2/3. The extra beds are good quality comfortable portable beds (extra charge of 100 Euros per bed) suitable for young children and young teenagers. To benefit from air conditioning they would obviously have to be placed in a bedroom. Alba is extremely spacious (159 sq m - 1679 sq ft) and has 2 air-conditioned bedrooms, each en-suite, a very large kitchen/dining/living area and a large terrace (24 sq m - 250 sq ft). It sleeps up to 6 people by using two comfortable convertible beds. The apartment has many original features including exposed rafters in the living/dining area and brick vaulted ceilings in the bedrooms and corridors. The master bedroom has a luxury en-suite with corner bath, twin washbasins, bidet and separate large shower with double French doors and a Juliet balcony with long views over hills and vineyards. This bedroom has a double king-size bed (160cms x 200cms). The other bedroom is en-suite with a shower and has double French doors leading onto a small balcony. It has 2 single beds which can be pushed together to make a super king-size double bed (180cms x 200cms). There is room for a cot in both bedrooms. The kitchen/living/dining area is a large impressive space with 2 double French doors opening onto the large terrace and 2 opening arched window/doors with Juliet style railings with electric sunblinds. For the winter months there is underfloor heating, a beautiful feature gas fire and a pellet stove (in the corridor). There are large sofas, a large dining table and a 3m island unit/breakfast bar with 4 stools. Asti is spacious (81 sq m - 855 sq ft) and has 2 air-conditioned bedrooms, one en suite and one 'virtually' en suite, a large living/dining area leading into a kitchen area and 2 large private patio areas. One (47sq m - 496sq ft) faces south and has outside furniture and a large cantilevered sun umbrella, the other (24sq m - 253 sq ft) is a shaded terrace area on the west side facing the valley. It sleeps up to 5 by using a convertible bed. There are old restored traditional Piemontese brick-vaulted ceilings in one bedroom and the kitchen area, old wooden beam features in the kitchen and living area and old exposed brickwork in the other bedroom. The spacious living area has 2 French doors opening directly onto the private outside patio area and another large French door opening onto the private covered terrace with views over vine-clad hills. One bedroom is en suite with a king-size double bed (160cms x 200cms), the other has a 'virtual' en suite across a corridor. That bedroom has 2 single beds that can be pushed together to make a super king-size bed double bed (180cms x 200cms). There is room for a cot in both bedrooms and room for an extra portable folding bed in one bedroom and both have French doors. In addition, Asti apartment is suitable for those with impaired mobility. Some portable mobility aids, eg shower seat and toilet frame can be supplied free of charge on request. Canelli is surprsingly spacious (40sq m - 422sq ft) and airy with a private south-facing patio and garden area (31sq m - 327sq ft) immediately adjoining the apartment. There is outside furniture with a large cantilevered sun umbrella. There is a living/dining/kitchen area with a large fitted kitchen and wide French doors opening directly onto the patio area. There are old restored traditional Piemontese brick-vaulted ceilings throughout. It sleeps up to 3 by using a convertible bed in the living area (not air-conditioned but a fan is provided). The bedroom has a king-size double bed (160cms x 200cms) and French doors leading onto the patio and garden area. There is room for a portable fold-up bed or cot in the living area. All kitchens are fully-fitted with a full-size oven (2 in Alba), microwave/grill, large fridge/freezer, separate fridge and freezer under the island unit in Alba, dishwasher and ceramic hob (induction hob in Alba). There is ample crockery and cutlery and a large range of glasses together with a comprehensive range of kitchen equipment and utensils. Other equipment includes a flat screen LED HD TV (46' smart TV in Alba, 32' in Asti and Canelli), 2.1 surround sound system and Bluray player (with MP3/ Ipod playback), satellite TV with English channels and free Wifi. There is also a hair drier in every bedroom, a steam iron and ironing board and drying rack. Linen is provided with 2 duvets per bed (different Tog ratings) and is changed on Saturday if staying for more than 1 week. 3 towels per person are provided including pool towels, these are changed twice per week. All beds have high quality mattresses and pillows with covers. All bedrooms have ample storage and hangars. They also all have the option of an opening window with a fly screen and fan for guests who prefer not to use air-conditioning. All bathrooms have large shower cubicles with a large fixed shower head and a separate wand shower. Baby equipment such as a cot and high chair is available for an extra charge if not pre-booked by other guests. The property is in one of the major wine and food areas of Italy. the world famous wine villages of Barolo and Barbaresco are a few miles away and Alba (world famous for its white truffles) and Asti (famous for its spumante and its Palio, older even than the Siena Palio) are nearby too. There are 18 Michelin starred restaurants within 40 minutes' drive (3 within 15 minutes') and numerous less expensive but good restaurants too. The town of Bra is only 40 minutes away, the birthplace of the international Slow Food movement and the venue for the world famous biennial international cheese festival held in odd number years.In September and October in particular there numerous wine and food festivals in all the local towns and villages. There are hundreds of vineyards in the locality, many of which do tastings and cellar sales. These produce a range of both red and white wines including Barolo and Barbaresco red wines (the nebbiolo grape), robust reds from the barbera grape and sparkling whites of various types. The local town of Canelli is a major centre for methode champenoise wines and its vast man-made caves are used to store the wine at the correct constant temperature. These are known as the Wine Cathedrals of Canelli and are a UNESCO world heritage site. There is a vineyard next door where very drinkable wine can be purchased and the internationally-known Icardi winery is a few hundred metres down the lane. Icardi produce various reds and whites, including their own Barolo, from grapes grown in their vineyards in the relevant areas. The area is one of the most important eno-gastronomy areas in the world and is a veritable 'foodies' paradise. Full details of restaurants and vineyards can be found in the apartment. There is a large amount of sightseeing within an hour and a half's drive, ranging from the beautiful and historic cities of Turin and Genoa to the Lakes Maggiore and Orta, the Alps and the Italian Riviera (including the Cinque Terre and Portofino). There are many old towns and villages to visit. There are numerous activities available including signposted vineyard walks almost from the property (some can be used for mountain biking too - a leaflet detailing them is available by email from the owners on request and will be found in the apartments), mountain biking and cycling (bikes can be hired locally but the terrain is quite hilly), golf and horse riding. There is an aqua park and a safari park both within 40 minutes' drive. Alba and Canelli apartments are not suitable for disabled access. Alba is also not suitable for toddlers, having several balconies. Asti is suitable for the disabled and for those with impaired mobility. There are however low threshold steps to negotiate to enter Asti and there is an internal step of 12 cms to some rooms. A ramp and other portable devices for the bathroom are available. More comprehensive details supplied on request. Both bathrooms are en suite and there is a separate cloakroom with toilet and washbasin. Both have high quality fittings with soft-close toilet seats and showers with large fixed heads and a separate wand. Bathroom 1 is the master en suite and has a large corner bath and a spacious separate shower. There are twin washbasins and the ceiling is exposed brick vaulting throughout. Bathroom 2 is the second bedroom en suite and is a shower room with a spacious shower enclosure. Access to washing machine shared with other guests when not being used by cleaner. Large fridge freezer and separate fridge and freezer under island unit. Several ice trays provided and storage boxes for ice cubes. Modern, fast induction ceramic hob. There are 2 conventional ovens. Cafetiere and stove top espresso pot. Sets of dishes and cutlery for 12, large number of glasses of all types, including red and white wine, flutes and tumblers. Full set of pans and oven trays etc and large number of utensils. Extensive fitted kitchen with 2 full ovens, microwave/grill, large fridge freezer, additional fridge and freezer under island unit, breakfast bar with 4 stools, dishwasher and induction hob. Large dining table seating 8, highchair available subject to booking. Ipod and MP3 playback through surround sound system, leads provided as necessary. Pool toys available shared with other guests. Large first floor terrace (24sq m) with table and 6 chairs accessed via French doors from living dining area. Views across valley over vineyards. 2 large cantilevered sun umbrellas. Our 2nd visit to Cascina del Noce for 10 days was even better! The well maintained property has sensational views from Alba apartment. Huge kitchen, seating area and extremely well equipped. The hosts were onsite and very helpful with wine suggestions, places to visit and restaurants. There is an excellent information binder of the area. After touring everyday, we enjoyed the pool. We appreciated many extra touches like the herb garden, pool towels, bar fridge, large assortment of wine glasses. We brought bikes which were safely stored in the garage. It is centrally located to all the beautiful sites in the Piemonte area. Highly recommended! Thank you so much Ellie and Glyn! This is a really nice place to stay - and the owners really try to do their absolute best to ensure that everybody have a great holiday. close to a lot of things - both for kids and adults. been twice before - and will visit again next year. If ever we need to return to Northern Italy there is only one place we would return to - Cascina del Noce. Our stay here was the final stay of a five week visit to Northern Italy and we never imagined before we got here what awaited us. The whole package accommodation, scenery and wonderful hosts Eleanor and Glynn have made our visit an extremely pleasant and memorable one. We explored the area and around every bend we were speechless at the outstanding beauty of this area. One of our favourite days was spent at the panoramic lookout overlooking Castiglione Tinella and surrounds enjoying a picnic and bottle of wine. A must do. Another must do is a visit to the local restaurant Campagne Verde and be spoilt by the lovely Mirella. Ristorante del Belbo de Bardon in San Marzano Oliveto was a place we came across and enjoyed a delicious lunch. Unfortunately we must head home but hope to be back again soon and highly recommend Cascina del Noce. Our second stay at Cascina del Noce and once again amazing. We had a wonderful stay in the Alba apartment. The house has been beautifully restored with lovely ensuite bedrooms, and a lovely reception room / kitchen. The kitchen is very big and well equipped. The gardens are equally beautiful, and the pool a great size. Surrounding views are breathtaking, it's located in a very tranquil position, but there are many places to visit if you wish. A very detailed guest handbook is provided with restaurant options and excursion suggestions. The Villa is well situated with many interesting villages nearby. Eleanor also provided very useful information regarding local restaurants. We particularly enjoyed dining at L'Aromatica in Neive, the restaurant across the valley in Calosso, and Restaurant San Giorgio in Neviglie. Outside the summer season, there are many local festivals to provide a focal point for a long weekend or longer holiday in the area. Notably there is the huge Cheese festival held bi-annually in Bra in September, with entries from all around the world, the Alba Truffle Fair each weekend in October and November, the Palio of Asti horse race (older than that of Sienna) in September, and the festival in June each year celebrating the Siege of Canelli. In addition there are many local wine and food festivals held in the smaller local villages, such as the festa della barbera in Castagnole della Lanze held at the beginning of May, and the Rapule of Calosso in September. More information regarding festivals can be provided on request. A 500 Euro (£420) security deposit will be required prior to the release of the keys. Reasonable wear and tear (e.g. small number of breakages) will not be charged for.Two extra beds suitable for a child or teenager are available for an extra 100 Euros/week each. These are portable folding beds with additional mattress toppers for comfort. No payments other than security deposits can be refunded.